It is no secret that my favorite Mustang is the 289 High Performance "K Code," which also includes the '65-66 GT-350's. The book pictured here, LT-50, is now in it's fourth edition. It is a great book for the K Code owner or enthusiast and explains with text and pictures what makes the K Code Mustang unique. 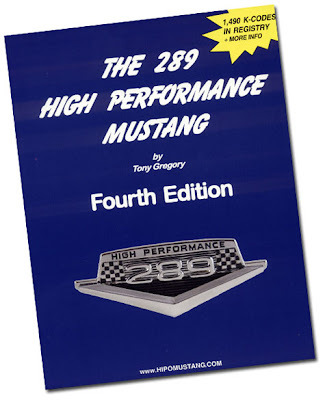 Many consider it the "bible" for the K Code 289 High Performance Mustang. You may want to also visit the companion web site - http://www.hipomustang.com/ and the fantastic forum on the site. You will find lots of great information there.